A grand celebration of the early days of the United States space exploration program, The Right Stuff is the finest level of ambitious drama. The story of men pushing against the farthest boundaries known to humanity is an exhilarating ride into new frontiers. Soon after the end of World War Two, breaking the sound barrier is seen as the next major achievement in aviation. At Muroc Army Air Field in California, experimental aircraft are coming closer to the mythical threshold, and many pilots are dying as the equipment fails around them. Finally, war hero Captain Chuck Yeager (Sam Shepard) breaks the sound barrier in the rocket-powered Bell X-1, despite flying with broken ribs. Chuck has the support of his wife Glennis (Barbara Hershey), who understands her man's desire to never settle for ordinary. Into the 1950s, Muroc is renamed Edwards Air Force Base, and the local watering hole becomes the preferred gathering place for some of the country best pilots who gather at Edwards set new speed records and test the newest, fastest and most dangerous planes. Yeager remains the spiritual guide for all the pilots, and he continues to re-set the speed record, including getting to Mach 2.0. When the Soviet Union surprises the world by launching the Sputnik satellite, the US government scrambles to catch up, and the Mercury space program is born. After a series of rigorous fitness and stamina tests, seven military pilots are chosen to lead America into space, including John Glenn (Ed Harris), Alan Shepard (Scott Glenn), Gus Grissom (Fred Ward), Gordon Cooper (Dennis Quaid), and Walter Schirra (Lance Henriksen). The men form a tight bond and are anointed as the brave new explorers of the 20th Century, celebrated by the press as an excited nation gears up to confront new frontiers. Shepard becomes the first American to launch into space, followed by Grissom, but the latter's flight is blemished by a mishap upon splashdown. Glenn is then selected to become the first American to orbit the earth, and his flight will feature an unexpected distraction. Back at Edwards, Yeager recognizes the changing times, but continues doing his thing: flying the most dangerous airplanes as fast and high as they can go. Now recognized as a classic and one of the best films of the 1980s, The Right Stuff was remarkably a commercial failure upon its release. In 1982 space movies meant Return Of The Jedi and E.T. : The Extraterrestrial. Audiences enamoured with light sabres, laser guns, warp speed and cute aliens were not ready for a reality-based ensemble piece about the seemingly mundane business of figuring out how to take the first tentative steps into space. 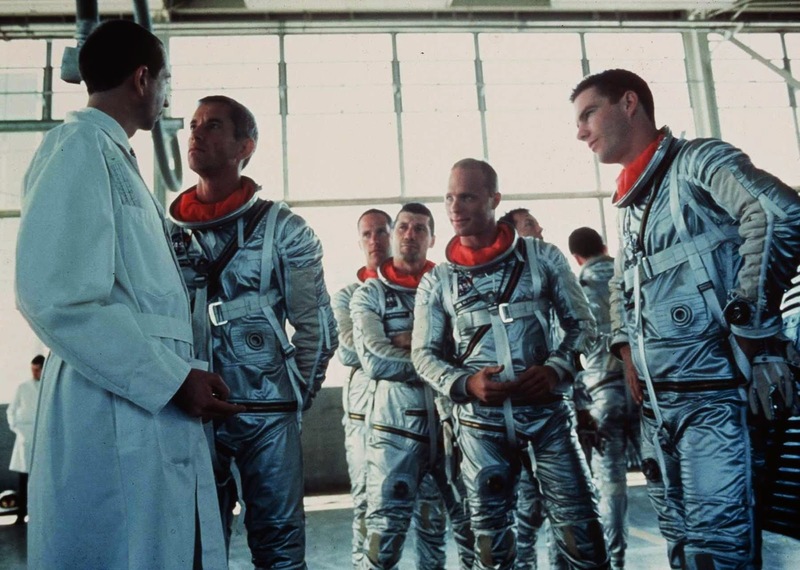 Clocking in at a remarkable 192 minutes, The Right Stuff flies by at the speed of the sound. Director Philip Kaufman adapted Tom Wolfe's bestseller into an almost mythical story of modern knights daring to confront the monsters that live in the unexplored world of space travel, riding at the pointy ends of rockets launched with rudimentary, still-evolving technology. Except that this is all based on true events, and the bravery demonstrated by men like Yeager and the first astronauts laid the groundwork for humans to walk in the moon, a mere 10 years after the Mercury 7 were selected. Kaufman's masterstroke is in weaving Yeager's story in with the space program. The Right Stuff blends the Greatest Generation that won the war with their younger and cockier brothers, men who reaped the rewards of victory and were then ready to take on the world - and space. Yeager represents the inspirational warriors of war, while men like Glenn and Shepard are the warriors of space exploration, who would not exist without the security and confidence that came with victory. The Right Stuff includes plenty of colour, character, and surrounding personalities to humanize the story. The link between celebrity, money and success is made early, as the pilots and the politicians realize that secrecy does not pay-off; handsome men and their incredible flying machines will make headlines, and the money to sustain the program and allow it to flourish will follow. The wives of the pilots suffer in silence, but suffer they do. Betty Grissom (Veronica Cartwright) is humiliated by the ignominious treatment handed to her husband after his spacecraft sinks. Trudy Cooper (Pamela Reed) suffers through her husband Gordon's absolute belief in his abilities. And Annie Glenn (Mary Jo Deschanel) suffers from a severe stutter, a condition that will result in a painfully funny non-encounter with Vice President Lyndon B. Johnson (Donald Moffat). For the most part, government types (including Jeff Goldblum as a pilot recruiter), bureaucrats (particularly John P. Ryan as the Head of the NASA Manned Space Program) and rocket scientists (mostly Germans who switched sides after the war) are given short thrift and treated either as incompetent or clueless. The humour is appreciated, but it is left to other movies to recount the role played by the politicians and engineers to enable space flight. A film without any dominant performances, each of the main actors gets a few scenes to shine. Shepard casts the longest shadow, while among the astronauts Ed Harris finds the charisma that propelled John Glenn first into orbit and then onto a successful political career. Fred Ward, Scott Glenn and Dennis Quaid sparkle when called upon. Barbara Hershey enjoys the unusual role of the cool pilot's wife who threatens her husband to never change his death defying ways. 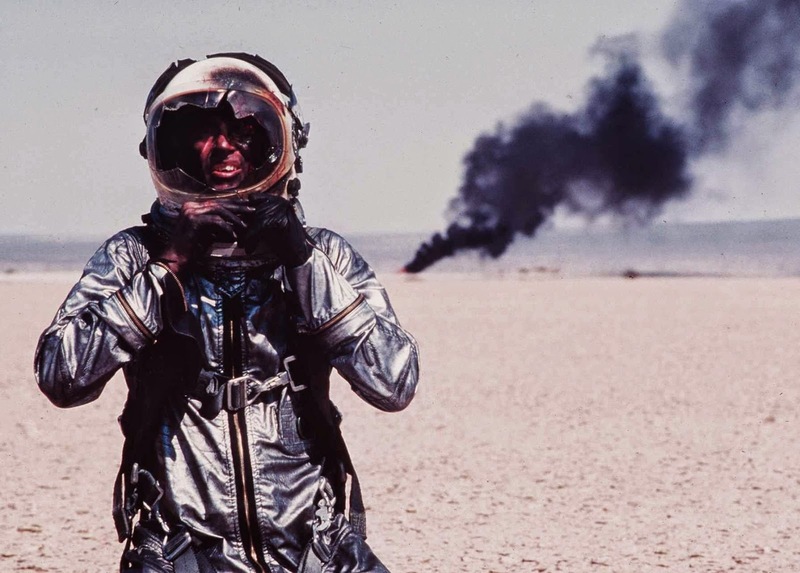 Kaufman and his cinematographer Caleb Deschanel create a wide-open and blazing look for The Right Stuff, with stunning recreations of test flights, rocket launches and travel through space. Even the Earth-bound scenes at Edwards Air Base are characterized by flat terrain and open skies, an invitation for a brash nation to come forth and explore. The film is a wondrous visual experience, capturing a bright-eyed can-do spirit riding on not much more than bravado and a political imperative to keep up with and then overtake the Soviets, costs and risks be damned.